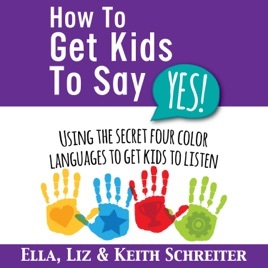 Want to get kids to say "yes"...instead of begging, negotiating, and pleading? We want what is best for them, and so should they. So why don’t they understand us? Because we talk to them in the wrong color language. Kids view the world in different ways. Once we know how they view the world, our words get through. Get through? Yes. Instead of our words bouncing off their foreheads and scattering to the floor, we can learn which way they view the world. Once we know this, we can use secret words that help them listen and understand. We don’t have to be psychologists, psychics, or super-parents. We just have to meet kids "where they are". Once we see the world the way they do, communicating is easy. No more stress, arguing, and frustration. Now, that is a win-win! The formula is easy. First, recognize which of the four basic personalities fits our kids. Then, talk to our kids with common words that fit their view of their world. It is up to us to meet our kids where they are. After all, they are just learning about their world. We can do this and have great fun while we get our kids to say "yes"...instead of "no".